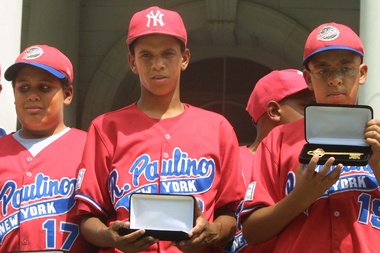 Danny Almonte was a pitcher for the Rolando Paulino All-Stars Bronx Little League baseball team that finished third in the Little League World Series in 2001. The team had to forfeit its wins because Almonte was found to be two years above the Little League age limit when he pitched. CHICAGO — The player at the center of the last Little League scandal 14 years ago said Jackie Robinson West shouldn't have been stripped of its Little League U.S. title and suspects race might have been a factor in the outcome. 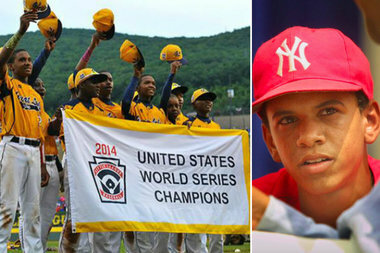 Danny Almonte — the star pitcher who was the centerpiece of a 2001 scandal that led to his Rolando Paulino All-Stars Bronx Little League team forfeiting its wins — said teams using geographically ineligible players is commonplace around the country and internationally. "Everybody do the same thing," Almonte, a native of the Dominican Republic, told DNAinfo Chicago Wednesday night. "Everybody take guys from different [places]." Danny Almonte (c.) and other members of the Rolando Paulino All-Stars Bronx Little League baseball team hold their keys to the city during a ceremony honoring the team August 28, 2001, in New York City. Almonte also suspects race played a part in Little League's decision to take away JRW's crown. "Those African-American kids did good, and they want to take that away from them. I don't think that's fair," said Almonte, who said he heard the news that JRW lost its title while watching ESPN. "I don't want to sound racist, but it's always something against Latin or African-American teams." Almonte's team finished third in the Little League World Series but forfeited its victories after it was proven Almonte was 14 when he pitched, two years older than the team claimed and above the Little League age limit. Reports eventually surfaced that the team's coach, Rolando Paulino, and Almonte's father, Felipe, were part of the scheme to conceal his true age. "When I used to play, my father and the coach and the other coaches at that time, I know they messed up, but it wasn't my fault," said Almonte, 27, who said he currently moves heavy furniture into new hotel buildings in addition to serving as an assistant baseball coach at Cardinal Hayes High School in New York City. "And it's not those kids' [JRW] fault either," Almonte added. "That's not fair to them. That's not fair for the whole Chicago city. I know you are proud of that team." Almonte said while he did not watch much of this year's Little League World Series, he said JRW "played the game the right way." "Their coaches, they're teaching those kids how to play the right way, how to respect the game," Almonte said. "They were there for one goal: to win the whole Little League [title]. Those kids, they did their job. They played the game the way they're supposed to play. There are a lot of teams that go there [to the Little League World Series], and they don't even know what they're doing." Almonte hasn't reached out to any JRW players or team personnel, but he said the players should be proud of their on-field accomplishments. "Just work harder and make sure you make it," Almonte said. "Don't worry about what happened. Just keep doing what you're doing. Just don't pay attention to it. They did the same thing to me. I never stopped. I kept playing and trusted myself. That's something that happened, and it's not baseball."